It is hard to understand why the Indian government continues to favour palm oil imports over homegrown edible oils in Gujarat and elsewhere. Dhirubhai is in dire straits. He can no longer recover his investments on the groundnuts he grows on three acres of land along the Junagadh-Verawal road in Gujarat. In a good year, he grows 100 kilos of groundnuts – or peanuts – for every Rs 4,000 he invests. The minimum support price – or the price at which the government buys the crop – is Rs 4,400. But the middle-aged farmer said government officials buy only from “vyapari aur mota rajkarmi” (traders and big farmers). Smaller farmers like him sell to private oil mills at very low rates. Last year, he got just Rs 3,500 for every 100 kilos of groundnuts – lower than both his investment and the minimum support price. In recent years, one of the biggest surprises in Gujarat politics has been the agitation by Patidars, the landowning dominant caste group also known as Patels. Lakhs of Patidars staged protests in 2015, asking for job reservations. Underlying the protests, however, was anger over the dwindling returns from agriculture – in particular, groundnut. The crop has played an important role in the community’s rise, said sociologist Achyut Yagnik. Originally hailing from north Gujarat, the Patidars travelled southwards to Saurashtra where the princely states engaged them as tenant farmers. After the land reforms in 1956, they became landowners and gradually moved from cultivating millets like bajra to groundnut. The surplus generated by the cash crop, said Yagnik, helped the community expand into agro-industries like dairy farming, oil and flour mills, engineering industries producing equipment for farmers, and other manufacturing businesses like ceramics and pumps. In other words, groundnut was one of the pillars supporting the Patidars’ emergence as one of the most powerful caste groups in Gujarat. In recent years, however, this economic scaffolding has weakened. As earlier articles in this series have reported, Gujarat’s small and medium sector is in trouble. As the next story in this series will outline, the state’s milk revolution is in trouble as well. And groundnut, as Dhirubhai illustrates, is nowhere as profitable as before. Blame it on rising edible oil imports – especially palm oil. Of the 100 kilos of groundnuts that Dhirubhai harvests, the husk and oilcake fetch just Rs 800. The most valuable byproduct of the crop is edible oil. 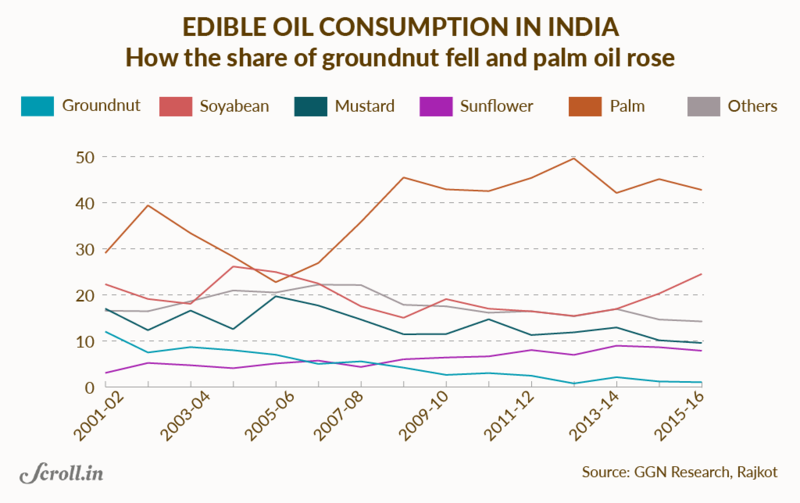 Since 2000, however, the share of groundnut oil in India’s edible oil market has fallen from 15% to 1%, while palm oil has risen. In this period, successive governments at the Centre have slashed import duties on palm oil, produced largely in Malaysia and Indonesia. In 2005, India levied an import duty close to 80% on crude palm oil. By 2008, it was down to zero. It has risen to 15% since then, but groundnut oil manufacturers say the damage has been done. Dayabhai Thumar, the owner of Shreeya Peanuts, a firm near Rajkot which supplies groundnut oil to Patanjali and peanuts to Snickers, said low import duties have tilted the price advantage towards imported oil. Agreed Bharat Mehta, the head of Solvent Extractors’ Association, which represents Indian oil producers. India’s dependence on imported edible oil has climbed from 3% in 1992-’93 to 75%, he said. Palm oil constitutes the largest chunk of imported edible oils. It is cheaper than other edible oils because of higher per acre yields. With 7.5% import duty, said Thumar, a litre of palm oil costs half the price of groundnut oil. That explains why the market has swung towards palm oil and why Dhirubhai gets a low price for his groundnut crop. In some ways, this is the story of all oilseeds in India. “When 60-70% of the edible oil is imported and just 30-40% is domestically produced, then the imported oil will set the price,” said a leader of the Bharatiya Janata Party in Dhar, Madhya Pradesh, on the condition of anonymity. Dhar is part of the Malwa region, which saw massive farmer protests this summer as soyabean, which yields soya oil, sold at Rs 70 per kilo, far lower than the minimum support price of Rs 105 per kilo. Rapeseed sold at Rs 55 per kilo despite a minimum support price of Rs 67 per kilo. In Punjab and Haryana, similarly, mustard fetched Rs 3,100 per quintal, well below the minimum support price of Rs 3,700, said Ajay Vir Jakhar of the Bharat Krishak Samaj. 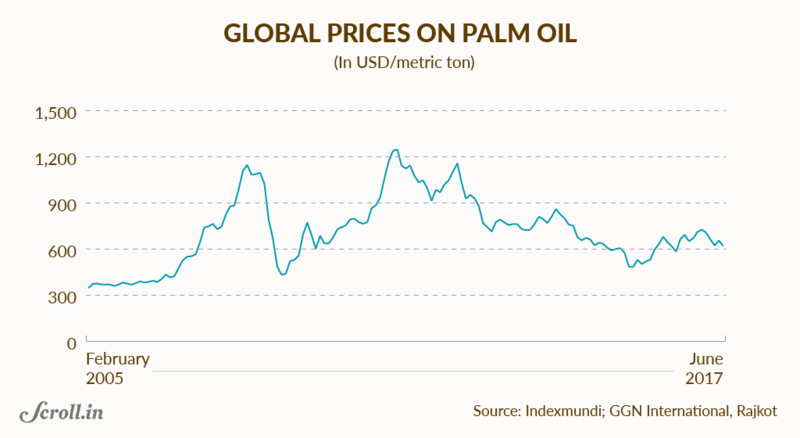 Farmers, however, are not the only ones hurt by palm oil imports. The industrial complex producing groundnut oil has suffered too. Saurashtra had as many as 1,400 oil mills, said Ukabhai Patel, a former president of the Saurashtra Oil Mills Association. The people who controlled the trade were known as the telia rajas – the oil kings. In the 1980s and 1990s, they were so powerful that it was said they determined who would be the chief minister of Gujarat. Today, said Patel, as many as 500 oil mills have closed. The ones which remain, added Thumar, survive by adulterating groundnut oil with palm oil, or passing off palm oil as groundnut oil. This rebounds on the farmers, further depressing demand for groundnut. Why have successive governments set the import duty on palm oil so low that domestic oilseed growers cannot even get the minimum support price for their crop? As Scroll.in found, none of the commonly advanced answers make much sense. Another explanation offered for low import duties are the norms of the World Trade Organisation which restrict import barriers by countries. 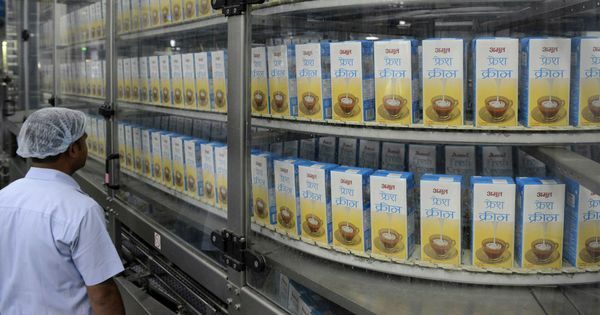 Dinesh Shahra, the managing director of Ruchi Soya Industries, said in the mid-2000s, United States successfully challenged India’s imposition of a 300% duty on soya. But Sen said that ruling was not binding on other oils. “Around the same time, we had a discussion with the Malaysians to bring down palm oil rates but even that was more of an assurance than a treaty,” he said. This slash in import duties is all the more puzzling because it undermined India’s drive to become self-sufficient in oilseed production. Back in the late 1980s, India’s foreign exchange problem was worsening. Since edible oil was the second biggest commodity that the country imported, the government began to push for greater self-sufficiency in oilseed production, said Sanjiv Phansalkar, a former faculty member at the Institute of Rural Management in Anand, Gujarat. It launched the technology mission in oilseeds in 1986. But to get farmers to sow more oilseeds, what was also needed was price stabilisation. For this, the National Dairy Development Board was asked to replicate its milk cooperative model for the oilseeds sector – initially, for rapeseed and groundnut. As MV Kamath wrote in ‘The Milkman from Anand’, the biography of Verghese Kurien, the Board’s founder-chairman, the idea was to loosen the grip of Saurashtra’s oil mills, which underpaid farmers. Remunerative prices, it was felt, would increase the number of farmers sowing groundnut. Accordingly, in 1989, the Board launched the edible oil brand Dhara. The initial results were good. Between 1984-’89, average annual production of groundnut stood at 6.59 million tonnes. That climbed to 7.81 million tonnes between 1989-’94 and 8.1 million tonnes between 1994-’99. The oilseeds mission also led to an increase in the production of other oilseeds from 12 million tonnes to 25 million tonnes, said Mehta. Then came the first setback. In 2001, Prime Minister Atal Behari Vajpayee reduced the import duty on palm oil after a trip to Malaysia. Till the 1980s, the groundnut oil value chain in India had been an uncomplicated two-step affair – farmers grew the crop and oil mills crushed it. In the last 25 years, this chain has lengthened. Oil refining companies came up. They processed crude oil, not oilseeds, to produce refined oil. The sector also saw the entry of palm oil exporting countries like Malaysia and Indonesia and importing companies like Adani Wilmar, Cargill and Bunge. Players in this value chain had conflicting interests. In the old days, farmers wanted high prices while the telia rajas wanted to buy groundnut at low rates. Now, eager to reduce their dependence on local production, refined oil makers wanted India to import crude edible oil. Vajpayee alluded to them while announcing his government’s decision to lower the import duty. “We shall do so in a way which would safeguard the interests of our farmers and yet facilitate import of Malaysia’s palm crude for our underutilised refineries,” he said. But the reduction in import duties had a terrible impact on the farmer cooperatives. 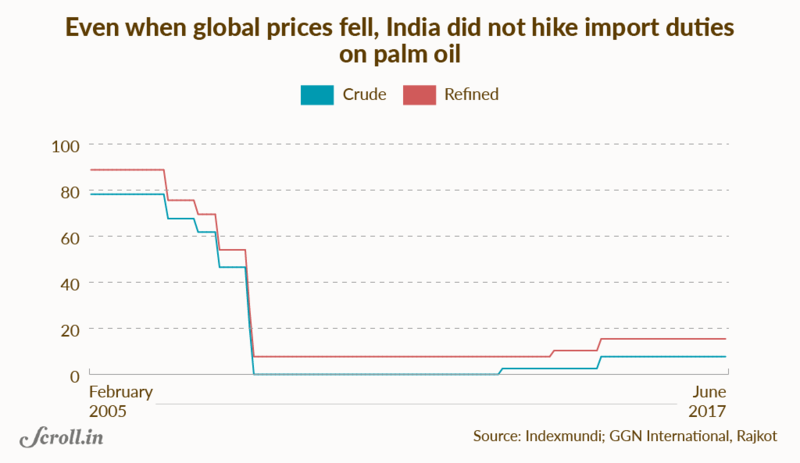 With imported palm oil flooding the Indian market, the prices of domestic oilseeds and the income of farmers fell. “Vajpayee ne ek push mein satyanash kar diya (In one stroke, Vajpayee brought about destruction),” said BM Vyas, a former managing director of the Gujarat Cooperative Milk Marketing Federation. Many farmers switched to cotton. Average annual groundnut production between 1999-2004 came down to 6.1 million tons. A second wave of import duty reductions began after the Congress-led United Progressive Alliance government came to power in 2004. Import duty on crude palm oil was gradually brought down from 78% to 0%, where it stayed till 2013 before rising to 2.5%, 7.5% and now 15%. Between 2004-’14, average annual groundnut production stagnated at around 7 million tonnes. Sharad Pawar headed both the ministries of agriculture and food supplies under the UPA. As outlined in this article in The Economic Times, Pawar’s ten years at these ministries were marked by a steady concentration of economic power among a few companies in every commodity and a surprising amount of flux in India’s export-import policies. So far, Pawar has not responded to Scroll.in’s questionnaire about the edible oil import duty cuts. This article will be updated when he responds. KV Thomas, the Minister of State in both these ministries between 2009 and 2014, claimed not to know why the import duties were slashed. “Our policy is always to help the farmers. We were trying to take a balanced view [between] farmers and refineries,” he said. It is a disingenuous answer. For most of his tenure, import duty on crude palm oil stood at 0%, which was against the farmers’ interests. Today, India is the largest consumer of imported edible oil in the world. Edible oil is the third largest item the country imports – worth Rs 70,000 crore a year. 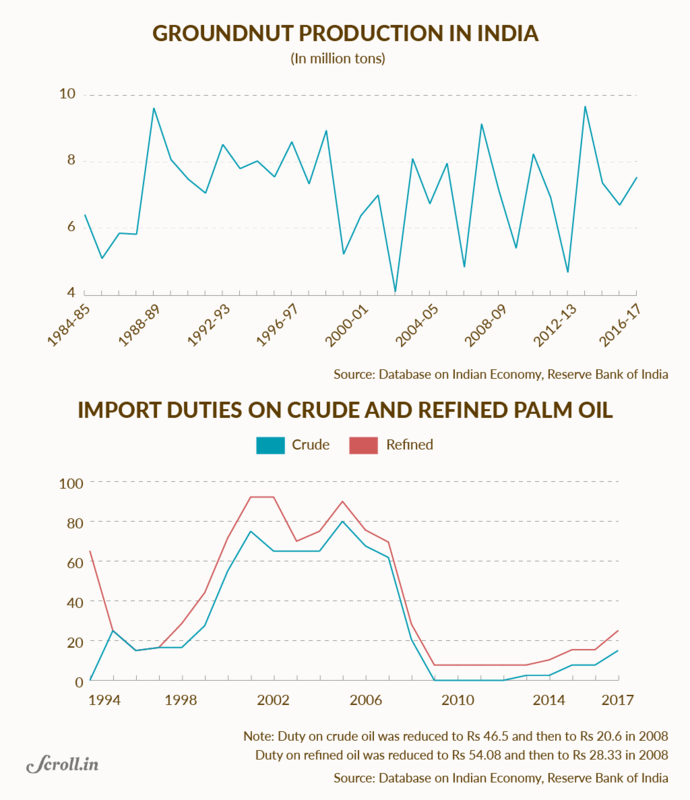 While India first began by importing crude palm oil from Malaysia and Indonesia, over time, the imports of refined oil have risen. According to this Reuters report, refined oil accounted for just 3.6% of India’s total palm oil imports in 2006. This rose to 31% in 2016-’17. More imports of refined oils protects the refining industry in Malaysia and Indonesia, increases the financial value of their exports, and helps a handful of large importers like Adani Wilmar, Bunge and Cargill. But it hurts Indian millers who have asked for a higher duty differential between imported crude oils and refined oils. Before the new rates were announced this year, Mehta said: “We want a 20% import duty on crude and 35% on refined.” But, instead of a differential of 15%, the government only increased the differential from 7.725% to 10%. In that sense, palm oil follows a larger trend in India. Government policy, said Sen, protects large-sized input-producing companies at the cost of a larger pool of small companies making finished products. Scroll.in’s Ear To The Ground project has this documented in several places. In Surat, for instance, the textile industry has been adversely affected by the government’s decision to impose an import duty on Chinese yarn but not on finished Chinese fabric. Small and medium garment factories buy domestic yarn from a handful of domestic producers at higher rates than what is internationally available, while cheap Chinese fabrics entering India put pressure on their selling price. Even in the case of edible oils, a handful of large importers of refined oil have gained at the cost of oil millers and farmers like Dhirubhai. Where does India go from here? One view is that the country should boost the import duty on palm oil to make oilseed cultivation more remunerative again. Others, like Shahra, feel the country should boost domestic palm oil production but this proposal has ecological implications. Another view, expressed by Phansalkar, is the country should exit groundnut cultivation entirely. With an estimated daily consumption of 30 gm of edible oil per person, he said, the countrywide demand for edible oils now stands at about 14 million tonnes a year – double of what India produces domestically. To increase domestic production, India will have to allocate more land for oilseed cultivation, which will clash against the need to grow more pulses. “Pulses are harder to find from the global markets while edible oil is easier to obtain,” Phansalkar said. But if policy makers believe the answer lies in more imports of palm oil, then the government must communicate this to the domestic oilseeds industry and help groundnut farmers like Dhirubhai make the transition to other crops.